Sydney Parkinson was the artist on James Cook's first voyage to New Zealand. 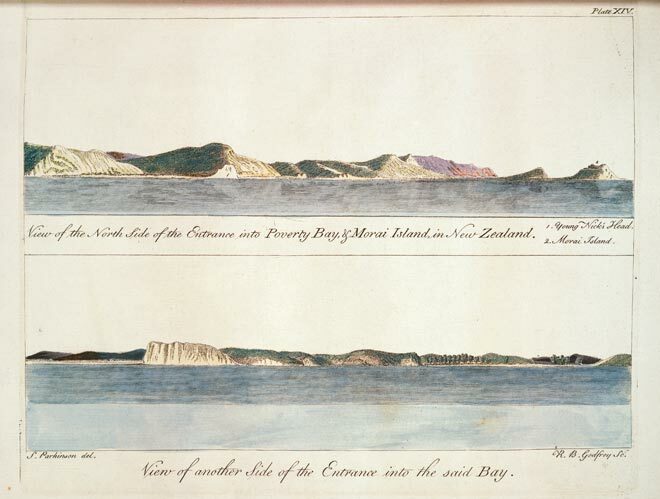 These were among the first images he made of Poverty Bay in October 1769 as the Endeavour approached the shore. Initially Parkinson portrayed a hilly place with steep cliffs, not a promising area for cultivation. But once members of the crew landed and explored the area further, they rapidly revised these opinions and were impressed by the soil's fertility, evidenced in the gardens of the Māori inhabitants. These images are hand-coloured engravings by Richard Godfrey based on Parkinson's sketches.